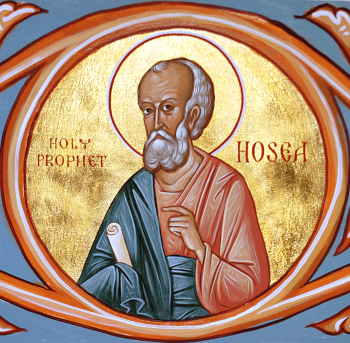 The Holy Prophet Hosea, the first of the minor prophets, belonged to the tribe of Issachar. He lived during the ninth Century before Christ, in the kingdom of Israel. He was a contemporary of the holy Prophets Isaiah, Micah and Amos. During this time, many of his fellow Israelites had forgotten the true God, and worshipped idols. The holy Prophet Hosea attempted to turn them again to the faith of their Fathers by his wise counsels. Denouncing the iniquities of the people of Israel (i.e. the northern kingdom Israel), the prophet proclaimed to them great misfortunes from a foreign people and their removal into captivity by Assyria. Almost a thousand years before the coming of the Savior, and through the inspiration of the Holy Spirit, the prophet foretold the end of sacrificial offerings and of the priesthood of Aaron (Hos. 3:4-5), and that the knowledge of the True God would spread through all the earth (Hos. 2:20-23). Hosea spoke also about Christ, how He would return from out of Egypt (Hos. 11:1; compare Mt. 2:15), that He would be resurrected on the third day (Hos. 6 and especially Hos.6:2; compare with 1 Cor.15:4), and that He would conquer death (Hos.13-14. Compare 1 Cor.15:54-55). The prophesies of Saint Hosea are included in the book that bears his name. The prophetic service of Saint Hosea continued for more than sixty years. The God-inspired prophet died in deep old age, having devoted all his life to fulfilling the Will of God.